By allowing us to trigger PowerShell scripts to run on a specific event, such as when an application is changed to the "Deployment" phase. This script would typically create all the items in the deployment tool (and possibly Active Directory too) so that the application is ready for deployment to live machines. If the Deployment Team prefer to create the deployment objects manually then they can use AppTracker as an information source. What is the package name? What is the command line needed for install? What are the prerequisites and dependencies? AppTracker can answer all these questions without the need for emails and phone calls to the packager (who happens to be on leave today). At this point you may be interested in taking a look at your applications journey from request through to "Live" in AppTracker to see how long it has spent in each process. 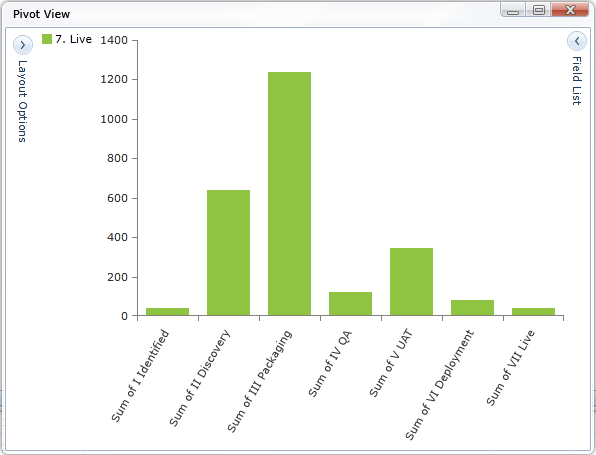 We can do this using the built-in reports to create a pivot chart. Here we can see the amount of time (in minutes) that the application spent in each process. It's clear that packaging took the most amount of time for this application. In our experience you can save approximately 25% of the time getting the application into Live by using AppTracker.